In just more than a decade, Fusion Worldwide has gone from a startup to a company valued at $285 million, all without outside investors. The three things that have been most important to Fusion are talent, technology and tenacity. Here, we detail how those three come together for them, and what those qualities can do for you too. “It all starts with talent,” Fusion COO Paul Romano says. “When you have the right people on your team, you can achieve the great heights we aspire to.” “We have (and hire) confident people who are great communicators. They are people with a demonstrated history of success. When they're looking to really move ahead in earnings and career development, we can be that platform for them” Romano believes. If that description sounds like you and you’re looking for a challenging new sales job, take a look at Fusion’s Careers Page on LinkedIn. The Takeaway: If you’re an employee, make sure your abilities match your responsibilities. If you’re the boss, make sure your employees have the right skills not just for what they do now, but also for what they could do for your company in the future. You may not always know which ones will become the rock stars, but if they have the right attitude and aptitude they have a great chance. ScoutSearch (Fusion’s exclusive sourcing software) scours a database of over 25 million transactions, product availability and pricing trends. It insures that Fusion sales reps have all the information they need to quickly support customer requirements and get deals done. Their fast-moving nature keeps customer production lines up and running without a hitch. Not all of the hard work is done by machines though. Fusion’s sales and executive teams travel over a million miles each year for face-to-face meetings with customers and suppliers across the globe. Having such a solid infrastructure from automation allows the people to invest themselves in great working relationships. The Takeaway: Although not every company has a robotic sales analyst, there are still automatic processes that can help any business scale. If you’re an employee, try to build one that would save your company a lot of time in the future. If you’re the boss, think about which one you might need next. 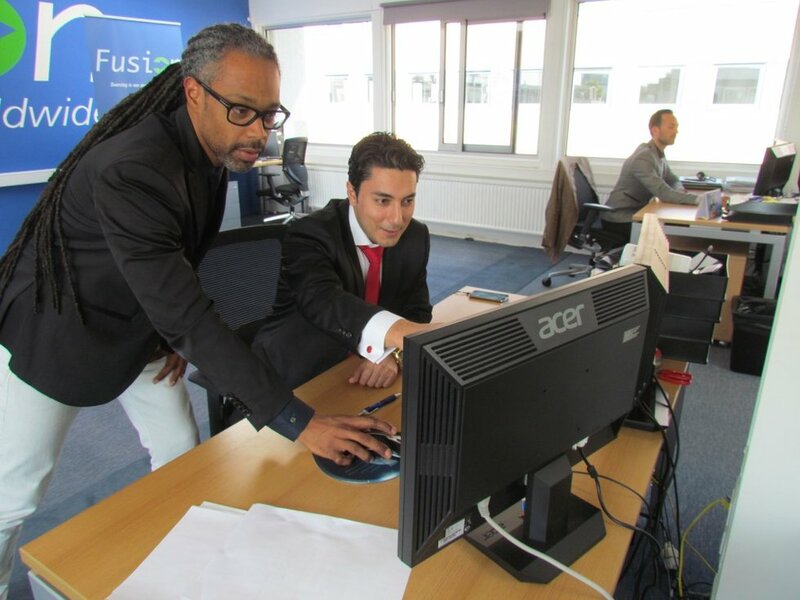 Fusion Worldwide’s team works together to accomplish ambitious goals every month, quarter and year. It doesn’t matter whether an employee has been there for a month or a decade; they are all important members of the organization because of their aggressive but team-friendly mindset. “We embrace A-players coming in here and making our entire organization better,” says Pat Deware, an Account Manager. ”New employees aren’t seen with targets on their backs. They’re only going to drive up productivity and earnings for everybody.” The C-suite isn’t afraid to reward workers, regardless of the cost, because everyone is feverishly attacking the same objectives. One Account Manager earned a six-figure commission recently. The CEO didn’t blink when writing the check, because there was more than a million dollars left for the company afterward. When sales executives win at big-game fishing, they get a big payday. Being tenacious doesn’t only mean landing new client after new client. In the spirit of customer service, Fusion’s Account Managers stick by their current ones and try to provide even more value for them. “Nothing in this job comes to you,” Luke LeSaffre, an Account Manager says. “If you just sit back and wait for things to happen, you’re going to fail, and fail miserably.” The Takeaway: If you’re an employee, do everything in your power to accomplish your goals. If you’re the boss, don’t set your employees’ goals too low, but give them the support system necessary to keep them going. Staying focused on big goals isn’t always easy, so it’s important to the success of any company for employees to feel appreciated. Thanks to the solid, long-term quality relationships the company has with its suppliers and customers, Fusion is able to remove the typical pains of the electronic component buying process. It’s no surprise that the company is ahead of the pack. The Overall Takeaway: With the right talent, technology and tenacity, your company can be an industry leader. What can you do to take another step in that direction today? Fusion Worldwide is looking for Sales Account Managers in three locations: Boston, Amsterdam and Singapore (among other open jobs). Plenty of promotions have been offered to high-performers within the company in the past, so a crack at being a leader by title could be in your near future. There's a Sales Account Manager job in Amsterdam waiting for you! Learn more about Fusion Worldwide.